A new report on brucellosis calls for federal and state entities to collaborate more on curbing transmission between elk and cattle. Last week, we reported the National Academies of Sciences, Engineering and Medicine were releasing a new report on managing brucellosis in the greater Yellowstone Area. The new report, an update on the Academies’ 1998 paper, would coincide with a public webinar on the disease. The webinar is scheduled for 9 a.m. MST. You can still sign up here. You can pre-order a copy of the Academies’ report here. To manage brucellosis in a complex ecosystem like that of the GYA, stakeholders and experts across disciplines will need to coordinate and cooperate to understand the costs and benefits of actions taken to control the spread of brucellosis. The committee said it is critical to incorporate participation by leadership at highest levels of federal and state agencies in initiating and coordinating discussions and making decisions. The infected elk populations have spread beyond the traditionally accepted boundaries of the GYA. In addition to the challenges of locating them, there is no effective brucellosis vaccine for elk, unlike for cattle and bison. 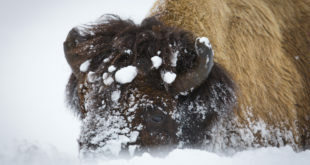 In the past, the National Park Service, U.S. Department of Agriculture, members of local tribal groups, and the three GYA states worked together to manage the risk of transmission from wild bison to domestic cattle and bison. A similar joint effort is needed to reduce transmission of brucellosis between elk and livestock. Under a 2010 interim rule to regionalize brucellosis control, the three GYA states created designated surveillance areas (DSAs) to monitor the disease in specific zones and to reduce the economic impact in unaffected areas. Brucellosis has been detected outside the original DSAs, resulting in expansion of surveillance boundaries. Currently, there is lack of uniformity in rules and standards in detecting infected cattle, which has resulted in an uneven approach to surveillance and setting boundaries that accurately reflect risk. If DSA boundaries are not expanded in a timely manner in response to wildlife cases of brucellosis, there is an increased probability that exposed or infected livestock may not be detected in time to prevent the further spread of infection as they are marketed and moved across the country. The committee recommended establishing uniform risk-based standards for expanding surveillance boundaries in response to finding brucellosis in wildlife. To make timely and data-driven decisions for reducing the risk of brucellosis, the committee also recommended federal and state agencies adopt an active adaptive management approach – a decision-making process to reduce uncertainty of outcomes over time. This approach should include hypothesis testing and mandated periodic scientific assessments that would equip the responsible entities with the necessary information to make decisions for managing brucellosis transmission. Another tool highlighted in the report is the potential to close supplemental feedgrounds for elk. Evidence suggests that incremental closure of feedgrounds could reduce the prevalence of the disease in the broader elk population and could benefit overall elk health in the long term. The committee recommended that state and federal land managers take a strategic, stepwise, science-based approach to analyzing and evaluating how the closure of feedgrounds would affect elk health, risk of transmission to cattle, and brucellosis prevalence. 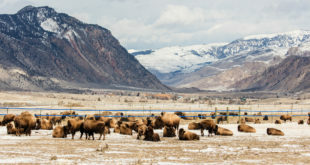 The committee also recommended developing a bio-economic model to address the complex nature of managing brucellosis in the Greater Yellowstone ecosystem. Such a model would provide a framework for decision making that would take into account the socio-economic costs and benefits of reducing transmission from wildlife to domestic cattle and bison, the reports says. The Academies’ study was sponsored by the U.S. Department of Agriculture’s Animal and Plant Health Inspection Service.